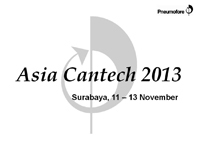 Our presence at this event is regular, at the 2013 edition you can find us in Hall 5 at booth 5C07. Hollow Glass production lines are frequently updated, improvements are applied to achieve higher manufacturing speed and a better look of the final product. Air Compressors and Vacuum Pumps contribute heavily to the moulding process on the IS machines. The 24/7 production does not only require efficient, but also reliable and durable equipment with the minimal downtime for service. The lowest Life Cycle Cost of UV vacuum pumps and A series air compressors is affirmed since decades, this is our base of success in this industry. Return on Investment calculations as low as 18 months are motivating customers worldwide to replace too-expensive-to-run equipment of our competitors. Looking forward to evaluate eventual improvement potential of your pneumatic system, come and meet us there! At this yearly meeting, the ‘centralization with few large vacuum pumps instead of several small ones’ is the traditional solution proposed by Pneumofore. Once centralized, the vacuum is better made by air cooled vacuum pumps of the UV series, rather than with liquid ring vacuum pumps, since in Asia the cooling water is rarely 15°C, as specified for their 100% performance. Actually, the measured temperature of the water used in south-east Asia for liquid ring vacuum pumps is about 28°C and this corresponds to 50% performance only. The short life of screw compressors, which require the Air End replacement after 3 years only, makes also the screw technology inadequate for the demanding, 24/7 running Can Industry in tropical countries. During the presentation at this year’s edition, besides the usual explanations regarding ‘why to replace liquid ring with rotary vane vacuum pumps’, Pneumofore also made the direct comparison to screw technology, which failed in most can factories in terms of durability and long term efficiency. An impressive large interest was shown by the attendants to the Pneumofore presentation entitled ‘Cost Efficient Pumps and Compressors for Cans’. The positive experience ‘replacing screw compressors and pumps with Pneumofore machines’ made by many customers from different Asian factories at the Conference, comes firstly from the dedicated ‘Hot Climate’ version of the air cooled Pneumofore pumps and compressors. Secondly, on the long run, speak 100.000+ hours of operation, also from the unbeaten lowest Total Ownership Cost of all Pneumofore installations. The Pneumofore success in China and Taiwan motivates us to participate at the Vacuum 2013 exhibition from 6 to 8 November at Big Sight East Hall in Tokyo. Japan is notably a big user of vacuum, especially high vacuum for several processes in the semicon industry. Some UV pumps are running since more than 10 years, continuously, in Taiwanese factories with similar applications. Surely, the UV pumps go into countless more industries with focus on large, centralized vacuum stations where efficiency, reliability and durability play a crucial role. Come and visit us at Booth E18. Of interest are also the workshop sessions organized by the Japan Vacuum Industry Association, on each day. Our CEO Eng. Daniel Hilfiker will explain about the rotary vane technology of Pneumofore on 7th November at 11:30 with presentation entitled ‘Rotary Vane Technology for Vacuum Pumps’. Welcome to assist! The usual version of vacuum pumps delivered to the BGI Group in Thailand is the UV50 W HC, the largest rotary vane machine in its water cooled W version for hot climate HC. The picture shows 5 such units ready for delivery after intense testing at the Pneumofore production facility in Italy. The first UV50 was installed back in 2008 and the total number of these pumps at the various BGI factories is now 19. 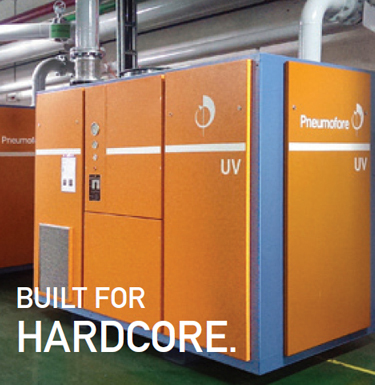 The ease of installation and smooth, trouble-free operation over all these years sets Pneumofore as preferred supplier for large size vacuum systems. 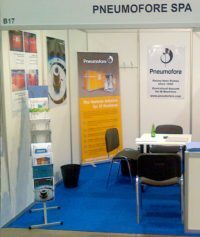 The good results of Pneumofore sales in the Asian glass factories base also on our regular presence at major events in the area. AFGM offers with its annual ‘Asean Federation of Glass Manufacturers’ Conference a technical session for the latest development in the glass industry technology. ‘Efficient Pumps and Compressors’ is what Mauro Ferrero, Director of Sales, will explain in Bali during his presence at this event. Pneumofore references are now found from Taiwan to Turkey, machines installed in the last 20 years, all living proof of continuous, long term reliability and efficiency. We fit perfectly in the frame of modern industrial management criteria like: higher efficiency – less waste – less pollution but also higher efficiency – higher productivity – higher profit. Good taste knows no geographic limit, Italian food keeps on being the humans preferred food. Simple to store, to cook and fantastic to eat with thousands of various sauces from ‘Carbonara’ to ‘Bolognese’ or simply ‘al Pomodoro’, the Italian pasta is found on five continents. Once a rare dish in Russia and very popular today, the original Italian pasta is now also made by Makaroni in collaboration with Agnesi. The Makaroni factory in the picture is a modern production site located in Balashov. Also in Russia the correct vacuum at the pasta extruder allows superior taste of the final product. Makaroni runs since Spring 2011 two Pneumofore UV16 H Vacuum Pumps to keep the pasta quality on top level. The direct coupling of rotary machines is the most simple, the most reliable and the most durable solution to transmit force. Gear boxes or belts cause energy losses and require maintenance. The direct coupling is chosen by Pneumofore as standard for all rotary vane machines, air compressors and vacuum pumps. The myth of Pneumofore machines ‘never die’ has a reason. The coupling left is the situation after 83.000 hours of operation, when the compressor UR3 was still running. 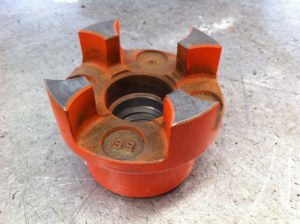 But the lack of basic maintenance and the missing replacement of the elastic element in the direct coupling caused the serious damage of the coupling itself. On the right you see the picture of a new coupling and the difference is evident. Also under such working conditions, the Pneumofore air compressor UR3 from 2003 kept to run. The repair job to recreate the initial state of the machine consists of the rotor replacement only, as the shaft was damaged by the loose coupling. The housing, the bearings and the vanes were still good. No screw compressor can manage such harsh working conditions and survive without replacement of the air-end. This and much more supports our statement that here we manufacture machines with the lowest Total Ownership Cost. 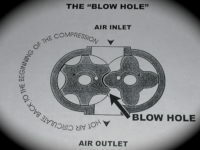 More air compressor manufacturers think that vacuum pumps require only the simple switch of IN and OUT pipe connections on their screw machines. 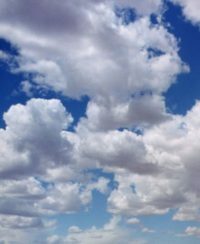 Some overseas companies apply this practice since several years, as they do not consider the Kyoto Protocol. Unfortunately, also European companies make now this mistake. If ‘blow holes’ problems persist on screw compressors, where the pressure ratio is only [1 : 8], how could the lack of active sealing guarantee 1 mbar(a) residual pressure, where the pressure ratio is [1 : 1.013] ? The inexperience of the screw compressor manufacturers, offering now also screw vacuum pumps, is shown by the use of oil circulation pumps, which are obsolete if the machine internal suction capacity was used. Furthermore, the gap between the screws can only increase, reducing the efficiency. The obliged replacement of the screw stages after 40.000 hours of operation, makes the screw vacuum pumps expensive ‘Total Cost of Ownership’ machines. Fortunately, to Pneumofore’s advantage, the market has evolved and customers care more and more precisely about the Life Cycle Cost of their equipment. Just consider the 5-year efficiency and functionality warranty on Pneumofore UV vacuum pumps. While politics and economy are abstract sciences, machine engineering is a solid discipline. Pneumofore is dedicated to solutions of pneumatic technology anywhere, we are not anyhow involved religiously or politically. Our open mind does not exclude deliveries in any nation, we just follow the rules. Exactly where industries are in trouble because of politically imposed embargo, our machines are highly appreciated. This comes from the simplicity of the Pneumofore machines, which allows OEM independence like no other: customers can service and eventually repair, even overhaul them by themselves. Pneumofore does not deliver directly but our good partners find ways to import our equipment almost everywhere. Surprisingly, we heard of our compressors being installed in North Korea, sold through our Chinese distributor. See the case study. Natural gas resources in China and neighbor countries are being used for the industrial and domestic home market. The burning of gas allows important reduction of emissions in the atmosphere, thus the idea is to continue with the search of new gas fields, with the construction of pipelines and with various storage solutions. Serious climatic and geological differences over the vast territory of China create different scenario and challenges. Pneumofore is active in the final phase of commissioning when new pipelines are built. All humidity in the pipelines can be evacuated easily and fast with the pumps of the UV H Series. Internal corrosion of pipelines can be widely avoided, but external corrosion remains a difficult task. The challenge is also due to the immense size of the present pipelines to manage. Future gas infrastructure projects are being evaluated. 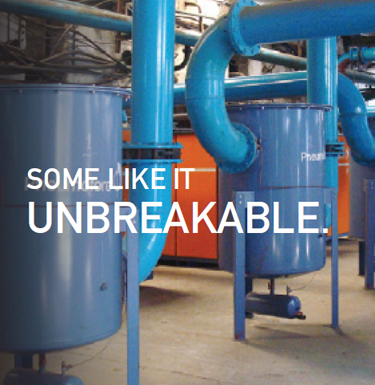 It takes years to prove durability and trouble free operation of large air-cooled pneumatic systems in difficult environmental conditions. An example are two UV50 HC that were installed back in 2009 and did run since than round the clock. Ordinary maintenance was executed correctly according to Pneumofore instructions with the use of genuine spares. The Hot Climate (HC) version of our large UV pumps is equipped with an oversize air cooling system allowing ambient temperatures up to 50°C. Where other vacuum pumps failed, the UV pumps of the HC series succeeded to perform according to the customer’s expectations, and better. As a result additional UV50 HC pumps where added and successfully commissioned in March 2013, now the total installed capacity of Pneumofore pumps is 13.500 m³/h. Some of the units are equipped with the variable speed drive (VS version) for the optimal coverage of the vacuum needs with the lowest electrical power consumption. 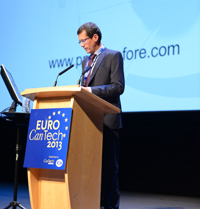 The Euro Cantech 2013, the technical conference for all the can makers, fillers and their suppliers has ended on the 28th of June. Location of the event was the prestigious ICC, a modern, purpose-built conference venue in the heart of Birmingham. This beautiful English city, an international and multicultural place, has hosted during this new happening worldwide visitors, even from Far East. All major global can makers were represented at the conference, thus covering the entire range of 2 piece and 3 piece can industry. Evaluating the post table-top feedback from other participants, the Pneumofore participation has been a great success and Mauro Ferrero, the Pneumofore Director of Sales, has explained during his presentation the directions that the technology of modern vacuum system is taking and what the advantages of a well-designed vacuum system in the ultra-competitive world of the beverage can making are. The benefits, that range from a more stable and constant vacuum at the production lines to a lower power consumption, are all quite important in the today industry. Manufacturers of industrial equipment know the difficulty of market penetration in countries like USA, Japan and Germany. Whenever somebody thinks to be the best, his interest and understanding is reduced, sometimes to the point of ignoring evidence. Last years, in 2012, Pneumofore sold in Germany a A90.4 rotary vane air compressor set at 3 bar(g), air cooled, with direct coupling. None of the prestigious German compressor manufacturers could offer the guarantee of 5 years of constant performance and efficiency. Curiously, our big boss is Swiss and creates a technological, market and mentality bridge, a connection between the Mediterranean and North Sea. Pneumofore vacuum pumps are frequent in Germany, but our compressors had not been sold there for years! In the low pressure range of 2,5 to 4 bar(g) we offer unique solution proposals, attractive anywhere. Glassman Europe 2013 has been a successful event for Pneumofore. We had really good visitors to our booth, a great way to celebrate our 90 years of activity! The Conference Program did support the positive result. There we presented the paper “How to improve Forming and Save Energy using Vacuum”, highlighting the advantages of our modern vacuum systems installed in different production lines worldwide. 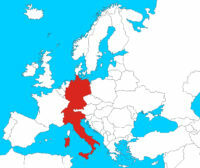 We wish to emphasize the high affluence of decision makers coming from extra European countries. At last, we take the chance to thank all visitors to our booth and look forward to good post-fair mutual business opportunities. An example of unusual machine operation is the variation of power supply, for instance the switch from 400 V, 50 Hz in Europe to 460V, 60Hz in America. This is required when one unit is expected to function in different countries, eg test run in Germany or China and long term operation in USA. In this case both the Frequency and the Voltage vary, but the modification applied on the electrical panel is minor, fitting easily in the existing cabinet. Replaced are a power switch and a dedicated double value transformer for the secondary electrical control circuit. This kind of specifications cannot be satisfied with off-the-shelf products and are fortunately distant from the large quantity serial production of most competitors, who do not offer easily single, special equipment. Instead, this rare requests are satisfied by tailored machines of Pneumofore, offering an expertise of 90 years excellence in rotary vane technology for heavy duty industrial air compressors and vacuum pumps, dynamic and flexible to find solutions where others get stuck. The trend of installing Variable Speed Drives on air compressors is spread among the world market. The specific efficiency of the compressors [kWmin/m³], depending on the technology, can vary considerably depending on the Hz value, which determines a certain rotation speed. On Pneumofore A series compressors we offer now the VS option without the penalty of strongly reduced efficiency. A possible solution applied on certain units is the use of 6-pole motors, which run as slow as 950 rpm. Now, being the usual rpm 1450 at 50 Hz, and being all Pneumofore machines also designed for 60 Hz countries, the resulting minimal operational window goes from 950 to 1700 rpm. On certain machines the frequency value can be set as high as 75 Hz, thus the rotation speed and accordingly the capacity can vary about 50% . We celebrate! Thanks to all the Pneumofore staff and suppliers we produce since 90 years excellent rotary vane machines, made to last. Time simply proves it. Pneumofore satisfies those high demanding technical requirements of niche markets, with severe performance, reliability and safety criteria. Applications with typical large use of our compressors or vacuum pumps are the moulding of glass containers, the can industry, the aerospace research, food, petrochemical, air separation, steel plants and forges. Every Pneumofore machine is a masterpiece of extraordinary mechanical precision for highest efficiency and minimal maintenance. The results are happy customers, who enjoy important power savings over decades. 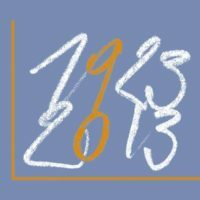 A special 2013 as we celebrate 90 years of Pneumofore! Guests are welcome anytime to visit our factory in Turin, Italy but we also participate to most Exhibitions and Conferences of the Hollow Glass Industry worldwide. Traditionally our sales come from References: our machines speak by themselves with their surprising durability and efficiency. Experienced glass people come to us when trouble with their present vacuum or compressed air setup needs a radical improvement. We will analyze the situation and design the most appropriate pneumatic system, a longterm solution for trouble-free operation over the next few decades. Glasspex India in Mumbai was back in March, in May you find us at Glassman Europe in Warsaw as well as at China Glass in Beijing. 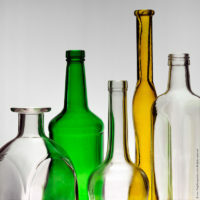 In October we plan our partecipation to the Conference on Glass Problems in US and Vitrum in Milano, Italy. After the AFGM 2013 edition, the last, major happening will be GlassTec Asia in Kuala Lumpur towards the end of November. Details regarding our Booth and how to meet us there can be found in the Fairs Section. Industrial vacuum systems design and pumps setup for the continuous evacuation of water vapour are frequent tasks at Pneumofore. Our documentation is complete and as true and precise as possible, still several engineers require to see with their own eyes to believe such an extraordinary feature. This is how we are pleased to welcome repeatedly vacuum experts at our factory. Actually, liquid stroke and water presence in the lubrication circuit can cause severe, sometimes unrepairable damage on other pumps. With operational temperature of 115°C and the use of the synthetic cooling fluid PLV411, the Pneumofore UV pumps of the H series keep their unique feature of water vapour suction in considerable quantities for drying, packaging, food, cooling and freezing processes. Our engineers will be pleased to analyze and find solutions for such industrial applications, always with the basic Pneumofore approach of minimal ownership cost. Certified ISO 9001 since the year 1999, Pneumofore still shows better results in quality terms than the industrial average. 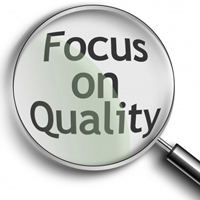 In fact, the ISO procedures did not improve our quality policy, which is our fundamental criteria of design and manufacturing since 90 years. The closing year 2012 shows again an impressive warranty cost value, corresponding to 0,73% of the turnover. Obviously, we also depend on suppliers for certain components and it did happen to face trouble with problematic parts. 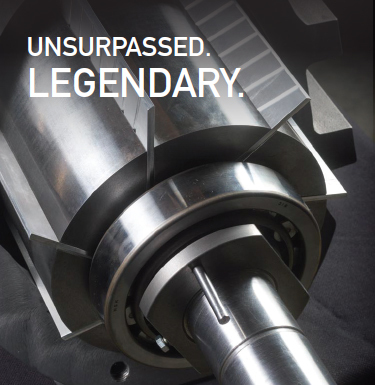 But the accurate selection of supply partners and the immense experience collected over generations of engineering result in extraordinary reliability and durability of the Pneumofore rotary vane machines. By the way, Pneumofore offers up to 5 years warranty on Air End functionality and efficiency; try to pretend this from a screw equipment producer!